You don’t have to look for ideas, just look for problems around you. Most of the people that aspire to build companies, become entrepreneurs and active players on the startup scene start first with a hunch that tells them: Go! Look for an idea! They think this is the ultimate truth and path in order to reach their final aspirations. Day by day, they spend their time wondering what a great idea would be perfect for their startup. Let’s take a look at a real example. Airbnb is one of the most successful startups in the past couple of years. Before Airbnb people had limited choices when it comes to booking and renting but now with Airbnb, they have unlimited choices when it comes to this matter. Founders of Airbnb created a simple and user-oriented platform where every individual can easily rent and book a place. As you can see the main idea behind a startup is to solve a problem that people have. It has always been like that. But most of us tend to miss that point. What problem do people have? Why is it so important to work on problems that people have? It is so important because it ensures that the problem really exists. And when you have a problem, you can start to think about how to solve it. Somehow, nowadays the most common mistake we make is to solve problems no one has and somehow in this process we lose ourselves in the belief that this idea will be loved by everyone. Is it important what you think is good or what market needs? Don’t think that your idea or product is original just because you and your friends think it’s amazing. Ok, it can be a good idea but is there a market that waits for this innovation of yours? Focusing only on the idea and not questioning what kind of problem we solve generally causes us to create products no one wants. These type of product we call vitamin products which are “nice to have” but actually there is no need for them. What we really want to build is a product that solves a real problem. These products are called painkiller products which are in the“need to have” category. Not having a painkiller product is what brings most of the startups to failure. So, why do startups fail? Quake Capital shared cbinsights' research about why startups fail and it’s great. Please take a closer look at why you should stop looking for ideas and start focusing on problems. 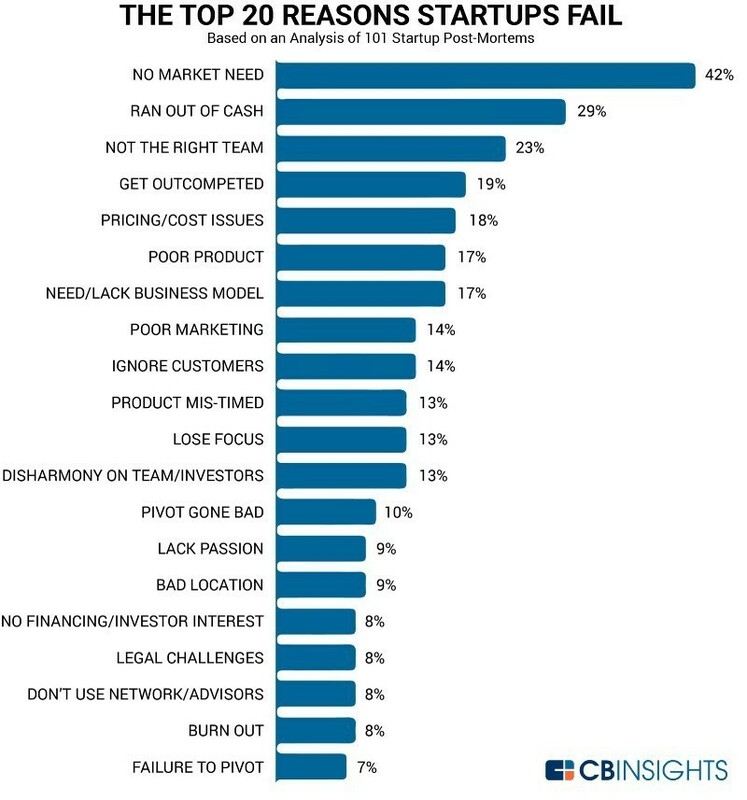 As you can see in below image the number one reason startups fail is that there is no market for their offering. Let’s say you have an idea that solves an existing problem. Is this enough? It’s not enough. There are other things you have to consider as well. First thing first. Don’t check if your idea is good with your family members or friends. Probably they will say it’s a really good one and that they would use it. Seriously. Don’t check your idea like that. Every mother believes her child is the best and prettiest. So let’s see what you can do to avoid this. Do lots of research before you start investing your time and money. Check first if someone else thought about the same idea you did. So, open google or your preferred search engine and start researching. Does this problem really exist? If yes, has someone already find a solution? Answer these questions with your research. If your research confirms that this problem already exists and people are talking about it and search for it, it means that you are on a good path. You should avoid creating a market that doesn't exist. By trying to create your own market you will be the only one that solves a problem. This is certain. But is there any gain? Are people interested to be part of that market? I believe no. So your gain will be equal to zero in the end. When you confirm with your research that the problem exists and that there is an already existing market for it, you also start noticing companies that already pursuit with this idea. These are your competitors. Again I repeat don’t be disappointed. At this point, you should start analyzing each one of them. Check how they solve this problem, do they have a similar approach as you envisioned, their customer's feedback and the overall success of the company. You should also analyze companies that were part of this market but they failed for some reason. Their story can help you a lot in learning from their mistakes. Remember you should check both sides of the coin. The success stories and failure stories and craft your concept. What is the unique thing that differentiates me from the rest in solving this problem? As usual, there are always alternative ways for everything. This concept is not an exception. There is one particular alternative to this method that I liked a lot. It has been confirmed by buffer CEO Joel Gascoigne. You can read more about his approach in “How to validate your startup idea”. An amazingly creative and simple approach that helped him verify his idea and eventually run a successful startup on it. Now, at the end what should I say? Time is our most precious thing. Before we spend it, we should think through and try to use it wisely. Don’t spend your days or years executing an idea that either doesn't solve anything or that doesn't have a market that needs it. Create a product people want.